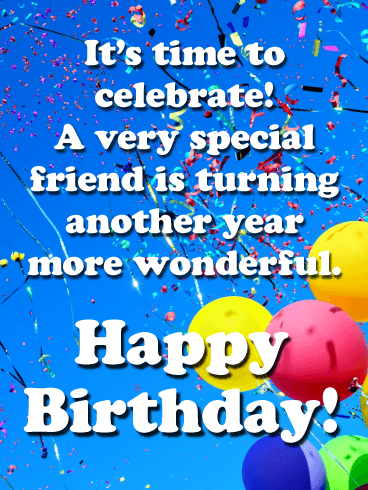 Another year of life has come and gone for your friend. Don’t let it go by unnoticed or uncelebrated! Send your dear friend the tasteful (and tasty!) Dark Chocolate Dreams happy birthday wish card to let them know how much you care! Wish them health and happiness in the next phase of their life, and remind them to feel accomplished about checking off another year well-lived! Another year of lessons learned, memories made, and goals accomplished. May this next season of life bring you even more joy and satisfaction. 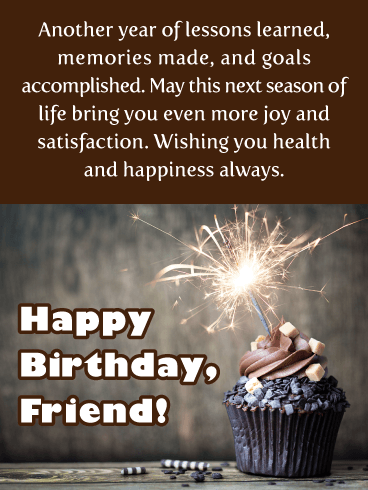 Wishing you health and happiness always. 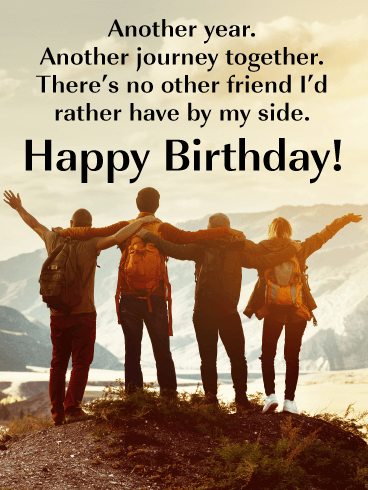 Happy Birthday, Friend. Colorful balloons soar into the blue sky as bright pops of confetti set the scene for an unforgettable celebration. 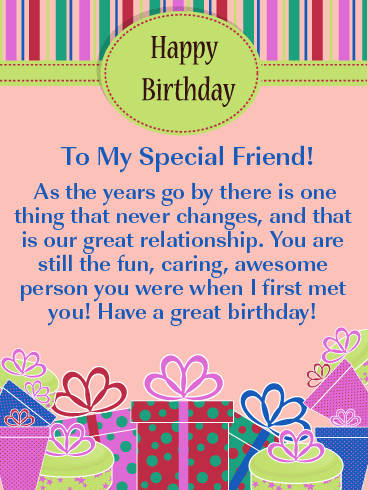 It’s all here on this birthday card for a special friend who’s turning another year older and even more wonderful. This festive greeting, with its heartfelt message, is sure to make them feel remembered on their big day while reminding them how much you care. This festive, gold-themed card was designed to make your friend’s birthday the brightest one yet! 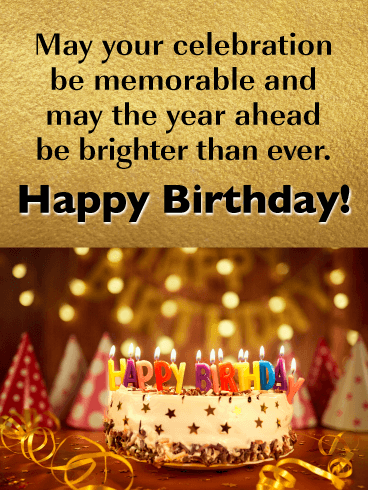 A cake decorated with gold stars and topped with colorful happy birthday candles is ready for them to make a special wish, and the glowing lights, party hats, and ribbon all around add to the festive spirit. Most important is you touching message, hoping they have a memorable celebration. Three colorful, frosting-topped cupcakes are each finished off with a single candle and festive wrappers, ready to add some fun to your friend’s birthday. It’s a chance to wish them happiness in the year ahead, while also letting them know how sweet you think they are. Surprise them with this card and you’re sure to make them smile! Who let the dogs out?? 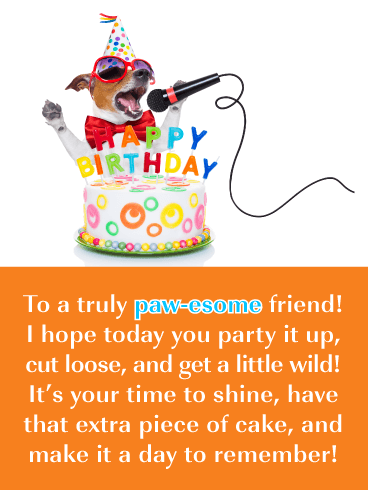 It was you, by choosing this Paw-esome birthday card! Send the singing dog Happy Birthday Wishes Card to your fun-loving friend to brighten up their big day! Encourage them to party it up, cut loose, and even get a little wild! No one can look at this goofy Jack Russell Terrier with a microphone and not smile! The group of friends on this card has just taken another adventure, and they stand together, arm in arm, as they celebrate the journey. It’s a symbol of the journey your friend takes on their birthday and all the possibilities in the year ahead. It also represents the close bond you share and how there’s no one else you’d want by your side through it all. Whether sent from one person or a group, it’s a touching way to let them know you remembered. 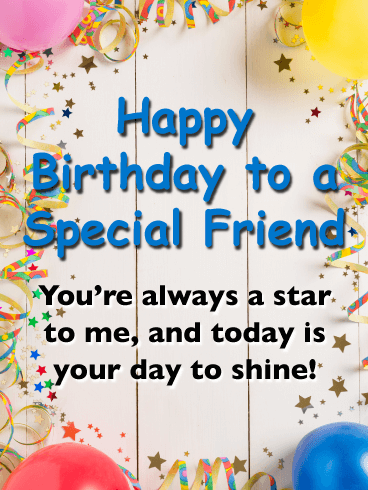 They’re the kind of friend who can light up everyone’s day with just one smile, so when their birthday rolls around, let them know with this heartfelt card. A small group of friends sits on the beach, facing the ocean. As the sun sets, they take a moment to celebrate being with each other. 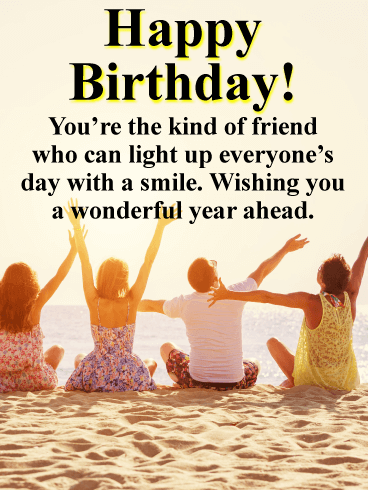 It’s a special way to wish your own friend a wonderful day and a year ahead that’s filled with happiness. Just looking at this awesome card is pretty much guaranteed to give your friend a sugar rush! 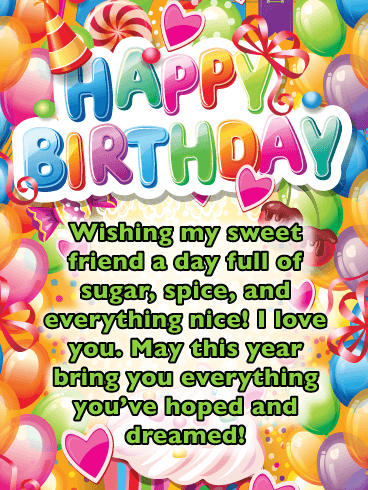 Get their heart pumping faster and their face smiling bigger with the Sugarcoated Dreams Happy Birthday Card! 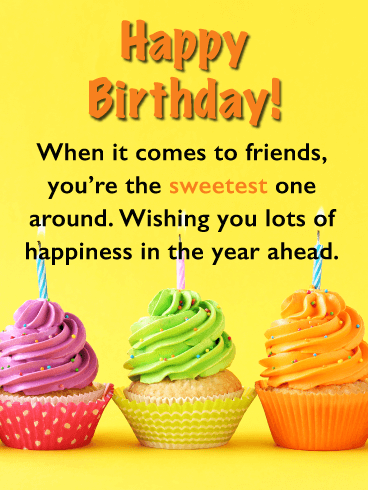 Send them birthday wishes as sweet as their friendship is to you. You’ve got their back and want all their dreams to come true this year! 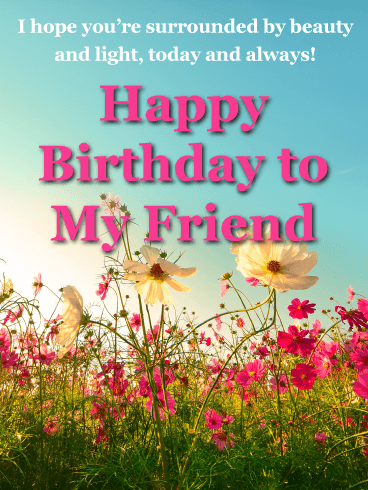 A field full of beautiful flowers is the setting for this touching card, which was designed to wish a wonderful friend in your life a very happy birthday. A clear blue sky with the sun streaming down will bring a brightness to their celebration, one you want to last all year. They deserve all of that and more because of how much they mean to you. A colorful cupcake feast for the eyes. At least, that’s how we’d describe this bright, festive card! 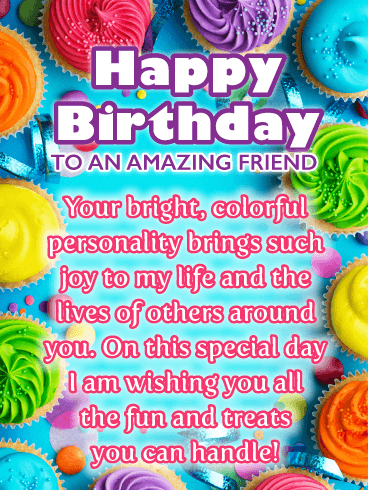 Send the colorful cupcakes Happy Birthday card to your sweetest friend to help them feel the love. Wish them a happy birthday filled with all the fun and special treats they can handle! Anyone else totally craving a colorful frosted cupcake right now?? 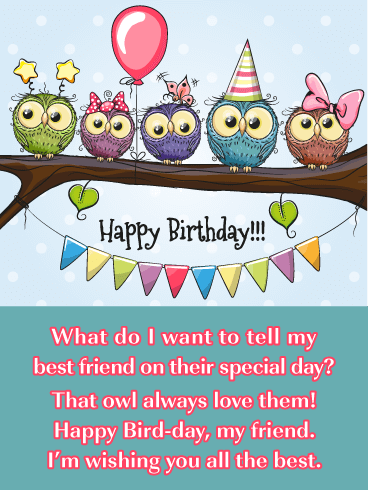 Featuring a row of cute as can be owl friends and fun wordplay, the Owl Always Love You Happy Birthday Card is simply perfect for your best pal! Send your friend this adorable card to wish them all the best and make them feel well-loved on their special day! Happy Bird-day to them, get it? It’s silly, but it’s also very sweet.